Run, walk, drive or skip to you nearest magazine retailer. 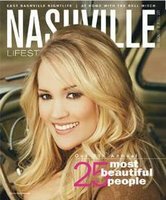 This month's issue of Nashville Lifestyles is worth a look. It has a special about the 25 most beautiful people in Nashville. I'm not one of them (according to the editors). But, CoolPeopleCare does get some recognition with a full page story. We're located right at the annoying part of the magazine where those inserts keep the thing open. So, before (or after) you rip out the subscription cards, give us a read. And then come visit.